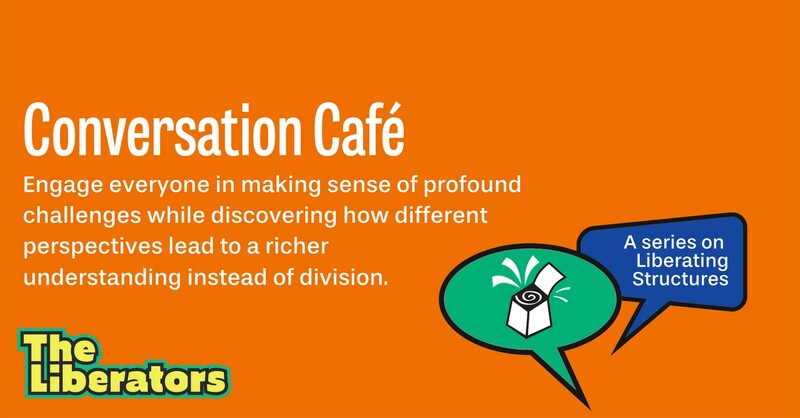 In this turbulent age of “fake news” and increasing divisions between groups and communities, the format of the Conversation Café offers a refreshing alternative. It encourages people to listen and understand each other’s perspective on a profound, shared topic or challenge instead of trying to convince or persuade others to see it your way. Sitting in a circle with a simple set of agreements and a talking object, small groups engage in consecutive rounds of dialogue. 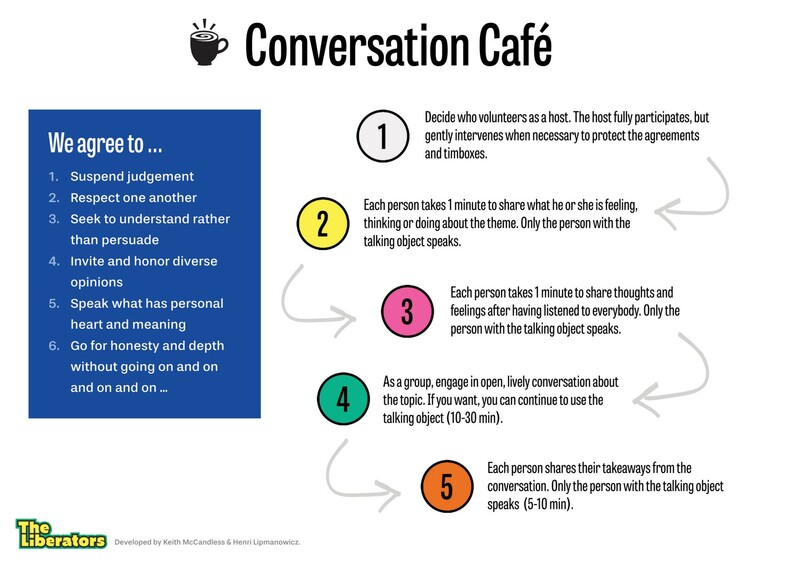 Conversation Cafe invites people to listen to one another’s thoughts and reflect together on a shared challenge. Conversation Cafe during the Scrum.org steward F2F, where we used it to build trust and safety by engaging groups in personal conversations. Note how carefully people are listening to each other, how they are leaning in and how they are giving each other their full attention. Below are some examples of how we’ve used Conversation Cafe within our Scrum engagements. I’ve clarified the purpose of Conversation Cafe in *bold* as defined by Henri Lipmanowicz and Keith McCandless. In January we facilitated the bi-annual Scrum.org steward meetup. Besides the course stewards, the participants were Scrum.org staff and some of Scrum.org’s customers. During the meetup, we used Conversation Cafe to channel the strong opinions everyone had into a constructive conversation. We wanted to avoid arguments based on lack of understanding. The talking object helped to achieve this by offering everyone the opportunity to clearly speak their mind. 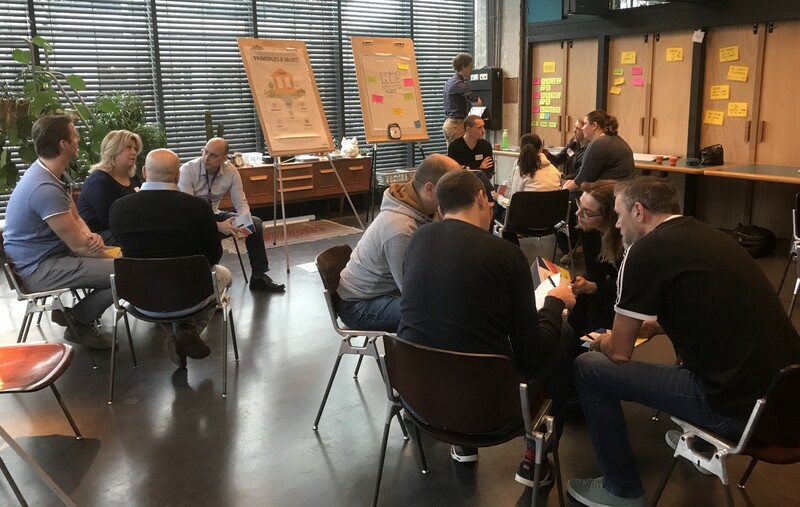 Swisscom and KPN iTV started a Scrum Master journey in 2018 to support the growth of their Scrum Masters. 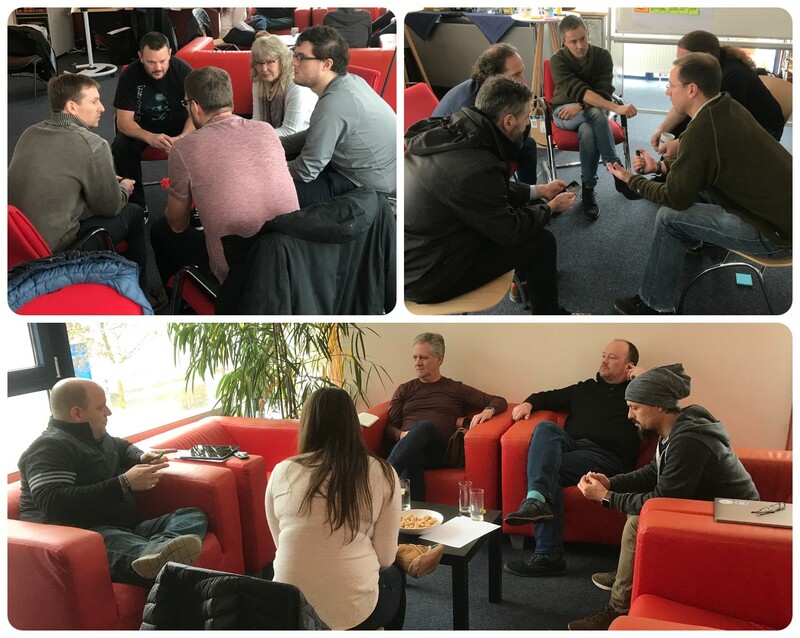 By organizing a workshop at Swisscom in Bern, we wanted to encourage cross-pollination and jointly generate new ideas for the Scrum Master journey. We used Wicked Questions to generate the topic for Conversation Cafe. It proved to be a way to explore the paradoxical challenges both organizations are facing. In the Scrum.org Professional Scrum Master II class, Conversation Cafe is used to explore the challenges that a Scrum Master faces as a change agent. The invitation we use here is: “What’s been the good, bad, ugly of your experiences as a Scrum Master in changing the environment of the Scrum Team?”. This helps participants make sense of complex, difficult, or painful situations and lay the ground for being able to move on. During recent Liberating Structures Immersion workshops, we offered participants two invitations they could use for the Conversation Cafe. Both with the intention to build a shared understanding of how people develop different perspectives and ideas. Option 1: “What has been your experience with techniques such as Liberating Structures related techniques for offering a new learning experience?” Option 2: “What has been your experience with stress or pressure caused by work?”. The vast majority of the group choose the second option. Given the feedback we received afterward, the conversation's participants were having around this topic proved to be the most valuable (and intense & emotional) part of the entire 2-day workshop! In a recent meetup of the Liberating Structures user group, we used Conversation Cafe to help participants appreciate those conversations that involve talking and listening. The invitation we used was: “What is your experience with making an impact on a team without being part of it?”. This triggered everyone to share their struggles while fulfilling roles as a Scrum Master, Agile Coach or facilitator. During the Scrum Master journey, we facilitate at the ANWB, we used Conversation Cafe to build trust and reduce fear with an opportunity for catharsis. Most of these Scrum Master already work for many years at the ANWB. As a result, they have lots of stories to share about successes and failures of using Scrum. Conversation Cafe helped them to share these experiences with each other and by that offer an opportunity for catharsis. Use Conversation Cafe in the Sprint Review to make sense of the challenges you’re facing with the development of a product. Give everyone the opportunity to share their perspective and jointly gain insights on how to move forward. 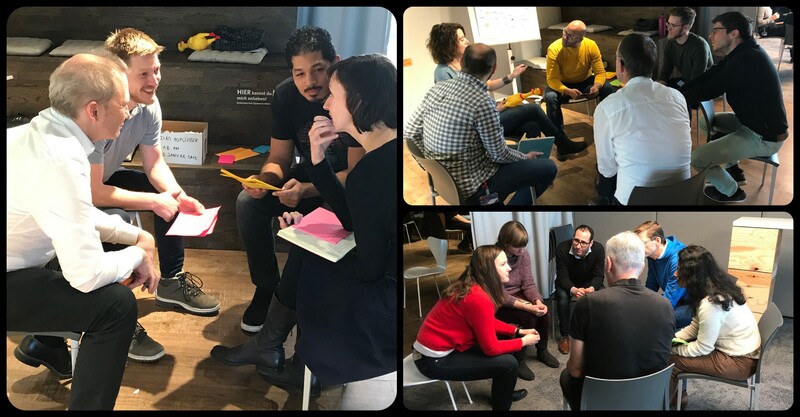 During the Sprint Retrospective, use Conversation Cafe to create a safe environment in which every member of the Scrum Team has the opportunity to speak their mind and share worries, anxieties or positive experiences. Conversation Cafe in a workshop with Swisscom and KPN iTV. Again, note how people are paying attention to each other. Use Wicked Questions to create input for the Conversation Cafe. Wicked Questions are about articulating the paradoxical challenges a group must confront to succeed. An example we recently used with Swisscom and KPN iTV is: “How is it that we build leadership teams within our Agile transformation and simultaneously expect self-organization and responsibility?”. Try What, So What, Now What for debriefing the Conversation Cafe. What have you seen, heard or observed that stood out? Why is that important? What patterns or conclusions are emerging? Now what? What actions make sense? Close the Conversation Cafe by defining 15% solutions. For example: What is your personal 15% Solution for letting go of the ineffective behavior? Something you do not need any additional resources, permission, or authority to do right now? After Conversation Cafe, encourage giving & getting help with Troika Consulting. This gives every participant the opportunity to ask consult for a challenge that emerged during the Conversation Cafe. Use invitations that are specifically ambiguous in that it is specific about the ‘problem space’ that people will be exploring while being ambiguous about the perspective they should take. In this blog post, we’ve described the Liberating Structure Conversation Cafe and how to use it within Scrum. The format of this structure helps people have calm and profound conversations in which there is less debating and arguing, and more listening. By explaining how to facilitate this structure and sharing tangible examples of how we’ve used it, we hope to encourage you to give it a try as well! Interested in joining an Immersion Workshop (again)? We’ve got another one coming up in May. If you’re aiming to join, book early. Our second workshop was fully booked months before the event. Or join the Dutch User Group to learn more about Liberating Structures.